Batman/Superman #17. 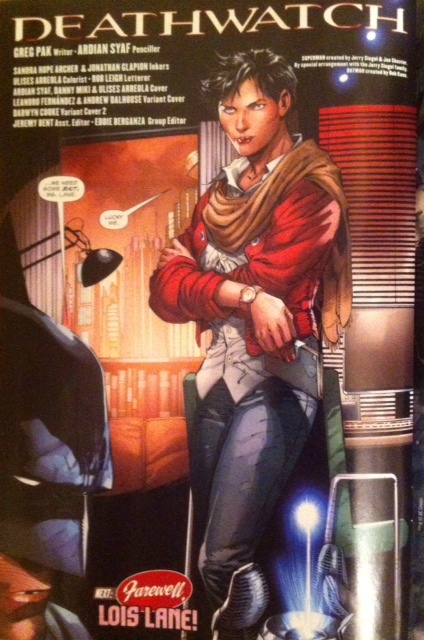 Greg Pak- Writer, Adrian Syaf- Penciller, Sandra Hope Archer & Jonathan Glapion- Inkers, Ulises Arreola- Colorist. Sometimes, comic books have covers that don’t always reflect the interior story. When there is a variant this is even truer. The Darwyn Cooke variant for this issue is a unique example of a cover that depicts the relationship between these characters in a manner one doesn’t associate with the New 52. However, there is a seed of truth that is present in the different permutations of their friendship. It is this seed that Greg Pak successfully builds on in his run on this title. The issue opens with Superman racing to rescue Lex Luthor who has been shot by the mysterious assassin. While Superman arrives in time to save Lex, we discover he was not in time to save General Ahmad and Glory Miau. The assassin is able to communicate to Batman and Superman in an unidentified disembodied voice. What the killer reveals is that he is killing all those Superman has saved. In order to try and identify the assassin, they enlist the help of Hector Hammond. They pay for the by allowing Hammond a memory from Batman. 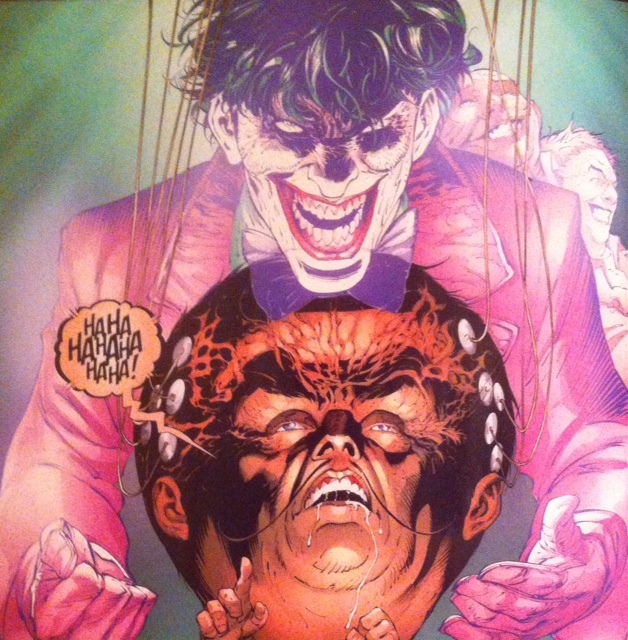 Batman gives him the Joker and in turn plants the seed for Hammond that they are looking for a psychotic. Between the three of them they narrow it down to one person- Lobo. It first appears that they are right, but Superman’s confrontation with Lobo ends with him being expelled from the planet in a quite humorous Super-feat. Superman’s dispatching of Lobo is extremely satisfying and funny. Superman and Batman’s relationship is characterized by an understanding of what each other does best and respect for their differences. But they also understand each other’s weaknesses and that is the bit that points to a true friendship. While not the same iteration of the characters on Cooke’s variant cover, we do get a glimpse of that essential truth in their dedication to working together to find this killer. Despite looking like someone aping Jim Lee’s work, Adrian Syaf’s art is very satisfying. I’m tempted to say he does a better Jim Lee than Jim Lee. There are moments that are understated and not as over the top as one imagines Lee would render them. The scene between Luthor and Superman is a bit clichéd and almost veers the story off in another direction. 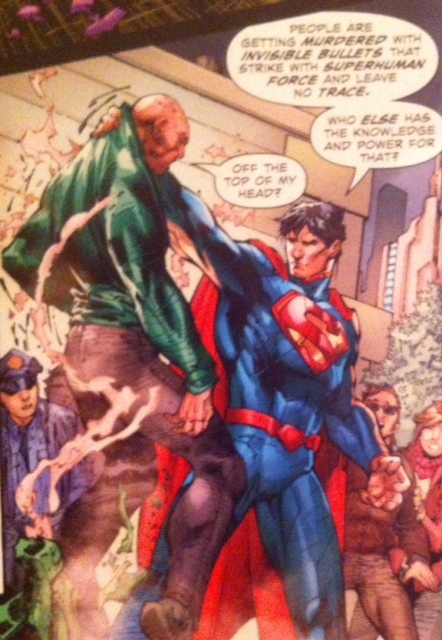 It would’ve been a treat to see Luthor actually grateful and Superman less confrontational. The bit with Lobo seemed to be only there for Lobo’s humorous send off. It kept the story from really moving forward. This is the fourth arc in this title since its launch. 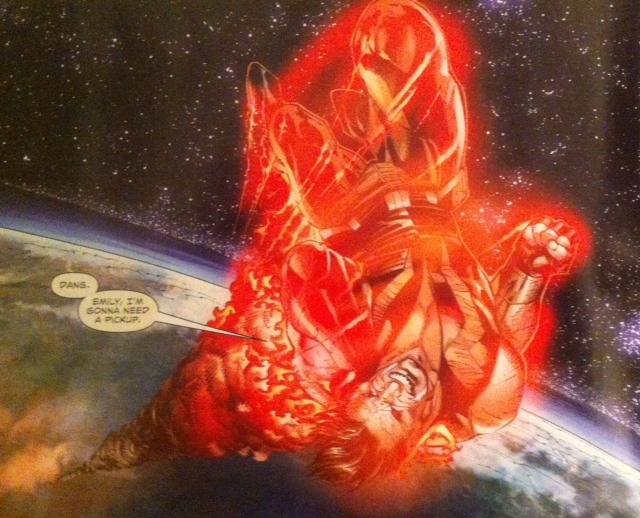 The arcs that featured the Earth 2 Batman and Superman were both very strong. The one with Toymaster and Mongul fell a bit flat for me. This arc is definitely in the same league as the Earth 2 stories. This is a new type of threat for Superman- a Batman type villain with superpowers that are a match for the Man of Steel. This arc seems to be setting up a situation in which Superman will at some point have to use some of Batman’s methods to defeat this killer. This is shaping up to be a very strong story.